Living in central Texas often means drastic and sudden weather changes. Of course these changes wreak havoc on our skin! Whether it's icy cold or a blazing 100 degress, we're always looking for that special body product that keeps our arms and legs hydrated and soft. 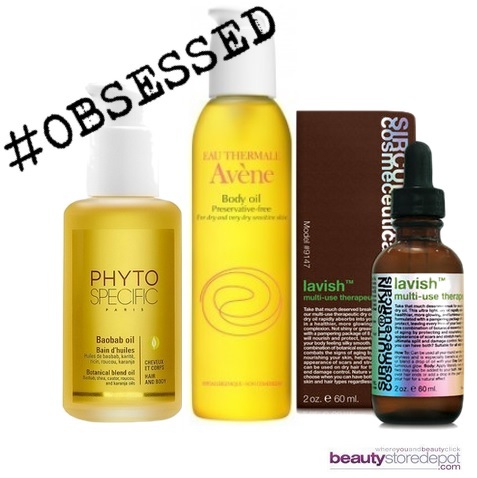 This brings us to our newest obsession, body oils! Body Oils have been around, but are recently gaining attention as the word gets out on their multi-use awesomeness. If you have oily skin, you're probably already thinking, No, Thanks! But forget what you think about oil! These innovative products are hydrating and silky - not greasy or sticky. You know we love Avene for all our sensitive skin concerns, so of course we're loving their new Body Oil! Rich in Avene Thermal Spring Water, Vitamins A and E, and Avocado Oil, your skin is in for a treat! It also absorbs quickly to restore your hydrolipidic barrier, which means it will treat current concerns while preventing future dryness. If you're a fan of Sircuit, (let's face it, who isn't?) you HAVE to try Lavish! This dry oil is the epitome of multi-use! Packed full of 9 precious oils, Lavish treats dryness on your face, body, and hair. You can use it to treat stretch marks, scars, split ends AND encourage healthy collagen! Keep it handy this summer if you'll be out in the sun a lot. It will soothe after-sun irritation and restore moisture loss. Another great option is Baobab Oil for Hair and Body from PhytoSpecific. With 8 lush oils, combined with Shea butter, this oil hydrates, softens and strengthens skin and hair. It also helps smoothe frizz and protects hair from harmful UV rays. What product are you currently obsessed with? Pin it from beautystoredepot.com with #obsessed #beautystoredepot! We'd love to see it!